These promotional 3x5 inch square corner dog boarding magnets – 20 MIL are going to surely loved by all those who have 4-legged pets. Value effective, easy and funny – these promotional magnets are surely going to stick in long run (due to their quality) and going to be the most cherished token until it lasts. 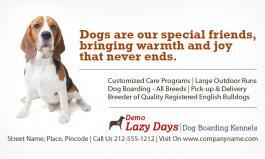 Admirable pricing benefits can be availed by bulk ordering these custom 3x5 inch square corner dog boarding magnets – 20 MIL. Perfect for animal groomers, animal supplies and all kind of pet service marketers. Request a quote to know price benefits that you can easily avail on bulk orders of these customized 3x5 inch square corner dog boarding magnets – 20 MIL.